Dear N Scalers: We are happy to announce a Post-Easter / Spring Clear Out Sale on a Number of Micro Trains Cars. Here's the list. Remember it's first come - first serve. Quantities are limited. Any five cars for on the list and you get them for 40% off (our cost)! Pictures of Cars are shown below. Call Pacific Western Rail Today to Order (866) 840-7777. Northern Pacific Road Number NP 98524 This green 40? 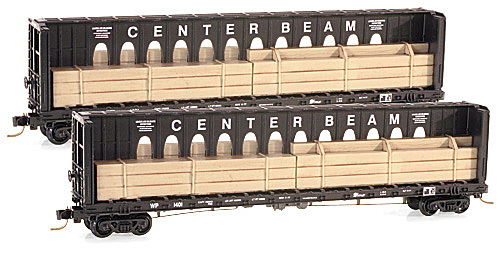 standard box car with plug door, has white lettering and white, red and black monad herald and runs on black roller bearing trucks. This 50 car RBL series 98500-98549 was built in October, 1958 by Northern Pacific?s Brainerd, Minn., Shops. They were equipped with Pullman-Standard Compartmentizer load dividers and stenciled with the yellow and red Compartmentizer monogram. RBL class includes insulated refrigerator cars without the ice bunkers or refrigeration units used to ship products not requiring refrigeration but still needing protection from weather extremes. Canadian National Road Number D&TS 2630 This 50? 2-bay ACF Center Flow? covered hopper with round hatches is CN reddish-brown, has white lettering and CN logo and runs on Barber? roller bearing trucks. 50 2-bay covered hoppers were built by ACF in the mid 1970?s for the Detroit & Toledo Shore Line Railroad. The D&TSL was strategically located between Detroit, Michigan and Toledo, Ohio and serves important industries at Monroe and Trenton, Michigan. These green and yellow Evans 3-bay covered hoppers were built in April of 1978 by Evans Products Company and run on Barber? roller bearing trucks. 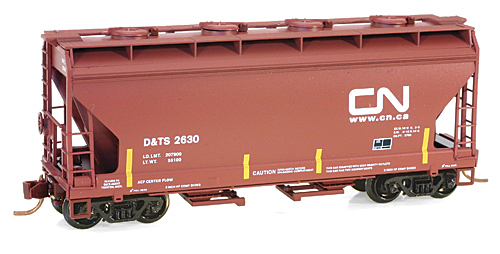 Evans was a supplier of freight cars, parts and loading devices, as well as freight car kits. Their loading devices revolutionized how freight was shipped. They are primarily responsible for the development of the coil steel car design still being built today.